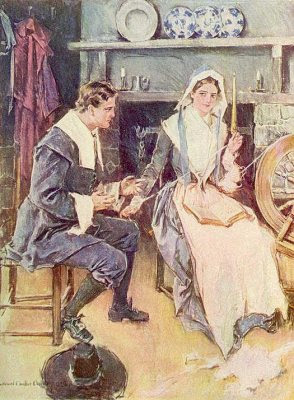 John Alden and Priscilla Mullins were most likely the third couple to be married in the Plymouth Colony. The story goes that Miles Standish asked John to court Priscilla on his behalf and that Priscilla smiled demurely and asked John if he wanted to speak for himself. And he got the girl. Then there's the story of Humility Cooper. Humility came on the Mayflower in 1620, in the custody of her aunt and uncle Edward and Ann (Cooper) Tilley. She was little more than a year old at the time. 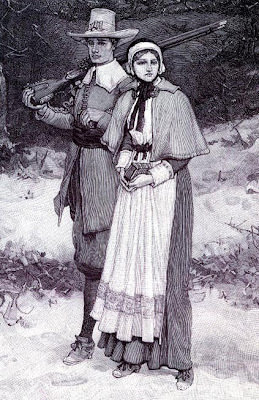 When Edward and Ann died the first winter, Humility was sent back to England. There is no record that she ever married or had children. This intriques me. What if things had turned out differently for Humility Cooper? What if she had not gone back to England? What if she fell in love and married? And then there's Mary Chilton. In 1620, at the age of 13, Mary came with her parents on the Mayflower. Her father was one of the first who died after the ship had anchored off Provincetown Harbor. Edward Winslow's brother John had come to Plymouth on the ship Fortune in 1621. Sometime between 1623 and 1627, John Winslow married Mary Chilton. I can just picture Mary and her girlfriends rushing to the shore at the news that a ship had been spotted on the horizon! Mary would have watched the passengers disembark, her gaze landing on the handsome (of course he's handsome. It's my story!) fellow seated third from the back of the rowboat. I imagine she and her friend Priscilla (Priscilla and John A. were not yet married) giggled and batted their lashes at the newcomers...discreetly, of course. Maybe John A. was already in love with Priscilla by this time. What if John A. saw Priscilla giggling with Mary and his heart grew heavy? What if became worried that Priscilla might throw him over for one of the men who had just arrived? Oh, the torture! John Alden had hired on as a cooper on the Mayflower, never intending to stay in Plymouth. But given the choice, he decided to stay. I submit that he fell in love. Who knows the romantic intrigue that might have transpired in the months between these two couples, and the other unmarried men and women in the Plymouth Colony? Could it be possible that Constance Hopkins was a contender for John Alden’s affections? Constance came with her father Stephen, step-mother Elizabeth, brother Giles, and step-sister Damaris on the Mayflower in 1620, at the age of 14. Constance's future husband, Nicholas Snow, arrived on the ship Anne in 1623. Constance was probably one of the young ladies who stood with Mary and Priscilla when that first ship arrived. But she had to wait until Nicholas arrived in 1623. What if she thought she'd never have a chance at the happiness her friends were experiencing? It wasn't like there was a plethora of eligible bachelors (or bachelorettes) in Plymouth Colony. What fun to look at our forefathers (and mothers) as something other than the staid Pilgrims who gave us Thanksgiving turkey and dressing, and squash dressing, and pumpkin pie! Some of them were young, and optimistic, and longing for a wonderful life in a new land. A new life with the right man or woman by their side. If you'd like to look at the list of passengers on the Mayflower and weave a tale or two of your own, click here. 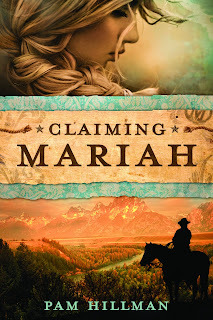 ***Also if you comment on this post, I am giving away an eCopy of Claiming Mariah. Thanks for stopping by and have a blessed day. 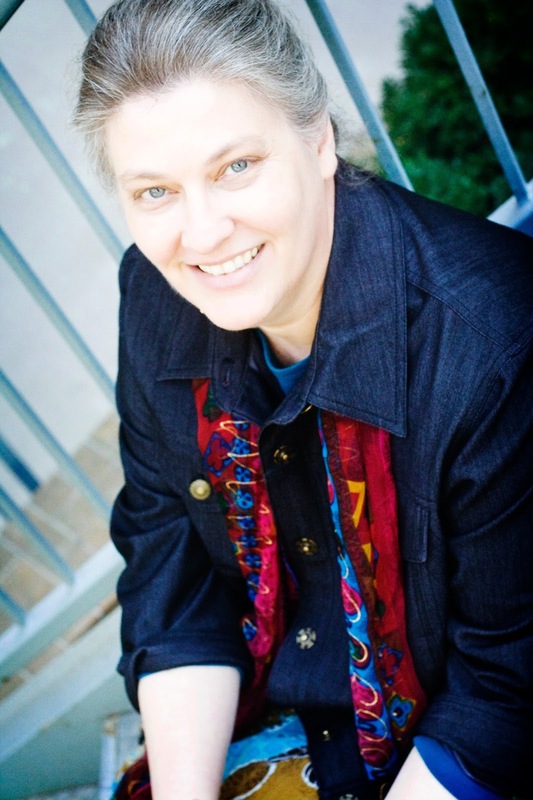 Great post, Pam, you helped put life into our forefathers/mothers. All I've ever thought about when it came to the Plymouth Colony was Pilgrims, Indians, Thanksgiving...thanks for opening up some 'what ifs'.....gets the imagination flowing. God bless. I hadn't thought of the romances etc and the wait. It would be cool to read a historical set at that time with a romance. I know when the first fleet arrived in Australia and there were a few boats. They had free settlers and a lot of convicts. When they arrived there was a lot of bad stuff happen which led to a lot of weddings. The male convicts were of the ship first and when they unloaded the female convicts they were not protected like they should have been. There were some who were able to fight of the advances and an aussie author Carol Preston has written a story starting with the arrival of the first fleet about 2 of these convicts who were able to stay safe and has written of the next generations. Thanks Pam, it wasn't a good start. everyone thinks Australia started out as a Christian country and while there was some inpact it wasn't at that stage. The first pastor came with the first fleet and would have been a Church of England and was known as the flogging priest as he thought the convicts if they did something wrong needed flogging. We then with all the irish convicts had Catholic priests. It was later we became a Christan nation. We don't have that heritage America has which is sad. Rhonda, what an amazing place to live for research. Love visiting historical spots. Have to choose my travelling partners though. I love your post! Thanks for the giveaway! Pam, we visited Plymouth Colony when we were in New England. My husband's ancestors have been traced back to England and the Mayflower. I loved seeing it all and my imagination went wild with all kinds of scenarios of what might have happened in those days. You've put into words that really give insight into the time period. Thanks for bringing up those memories for me. But then, I heard, "Mama! Mama! MOMMA!!!!!" Loved the info you shared. Thanks. I love that I always learn something new on this site! Wow, I love the way you think! All the possibilities of romance of our forefathers! I love it. Love stories about the Pilgrims! Don't have an e-reader, but would like to be included in the grand prize drawing. Your story ideas do put a different perspective on the Pilgrims. I think most people give little thought to them as real people. Kay, I agree 100%. It's hard to visualize such strong, determined, and God-fearing men and women as "real", isn't it? Betz, many times common people in uncommon situations is what triggers my imagination. No, I don't write about them, but I take that situation and put fictional characters in that situation. It's interesting to realize the pilgrims were real people with feelings. This sounds like a great book. Thanks for having the giveaway. Rose, so glad you stopped by. I can't wait to read Pam's new release! I've heard it's wonderful. I do hope there was romance back then! The life seems to be wrought with heartache over so many people lost in the sickness...I also hope there were the Florence Nightingale stories too!! Glad you made it to CFHS today, Eliza. They did have it tough back then, didn't they? We've got amazing technology, doctors, medicine right at our fingertips. Amazing what all has been accomplished in the last 250+ years. Thanks for giving us this perspective of the pilgrims. I work at a school, part of the time with kindergarteners. Each year, we watch the Peanuts version of the Mayflower journey so the images that flash in my head when I think of pilgrims are of Charlie Brown, Lucy, Linus, Snoopy, and friends! 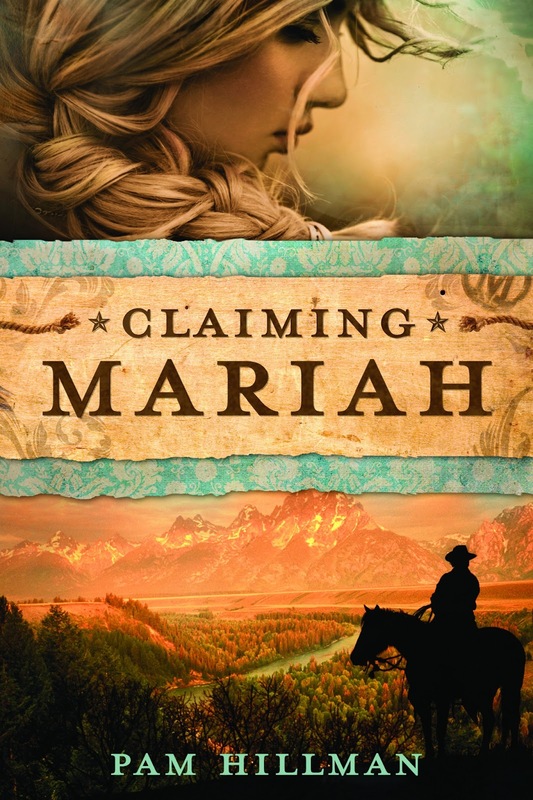 Claiming Mariah looks like a great book so I'd be very pleased to win your drawing. Thanks for giving away a copy. oh, that was fun. I love to think about people in history and picture how their lives were. I have written a few short stories on some people, my own ancestors among them. Thanks! That is funny. And my ancestors kind of make it easy on me. I learned that two brothers swapped wives!! No idea why, but it is a story just waiting to happen. You're welcome, Melody. Thank you for visiting with us today. Digging into their past interesting, isn't it? You never know what you might uncover! What a great scenario for a book series... The thoughts you put into what it was like and how the people arriving at the new world could only hope that God had someone in store for them in their new land. I'm sure those girls had little choice but to come to the new world with their families, or as servants, but can you imagine how terrified they were? I just can't imagine! Oh, Jorie, what fun that you and your mother researched your family history. Love it! Being 1/2 Irish, 1/4 Norwegian and 1/4 German, this intrigued me! How fun. My maternal grandmother came with her family from Norway when she was 16. She met and married my German grandfather; one of their daughters married my full Irish musical father. She was presented at a debutante ball ~ perhaps they became acquainted there. He did play beautifully on our Baby Grand piano! Actually, he told me she was the teller when he went into the savings and loan to refinance his spiffy car. Maybe she had noticed him before that. It was the custom that on Valentine's Day, a lady could send a gentleman a valentine ~ she did. She just happened to have the record of his address on file. By-the-way! Happy St. Paddy's Day, everyone! Wow, loved reading this bit of genealogy about your ancestors. Amazing that you have that much information. Thanks for sharing! Loved how your mom sent your dad the Valentine. Priceless! I loved your book Claiming Mariah!